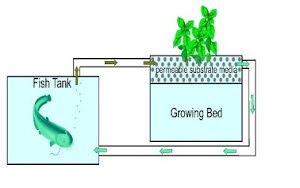 The Aquaponic raft system is a modification of hydroponic deep water culture. Deep water culture works well with aquaponics because the large volume of flowing water needed tends to keep the pH and temperature stable. This is good for both fish and plants. Ben Cox of Dover, OH shares. Many commercial operations use this system, although it can be a viable consideration for an individual, family or group too. Rebecca explains her system in depth at Food Chain Lex; a CSA. Could Dustin of Dustinsfishtanks on YouTube be more excited? There is a great deal to be learned and understood from the Community Supported Agriculture [CSA] not-for-profit organizations and commercial, larger operations. Good Luck! Building New Boxes for Hydroponic Growing * mhpgardener * 11:08 mins. "Recently, I moved the 4' x 8' box that I was using to grow hydroponic lettuce and other leafy vegetables. It wasn't easy to move by myself. So I've decided to build some smaller boxes, 32" x 48". These will be much easier for me to handle. And they will also allow me to do some testing of various fertilizer types and combinations. The boxes are made with 2 x 6 x 8 pine lumber and 7/16 OSB sheeting (plywood). I'm using 6 mil black plastic and 1 inch styrofoam insulation. I did go ahead a put a coat of stain on the boards to give a much better overall presentation. If all goes well, I'll be using these boxes for a very long time." Note: Could be converted to Aquaponic system. COMPLETE Aquaponics Trough Liner Installation * 16:44 mins. Tim Mann, from Friendly Aquaponics demostrates how to install 20-mil LDPE aquaponics trough liner. Larger Aquaculture System * cornellsmallfarms * 7:57 mins. On a tour of the Mass Ave Project, an urban farm in Buffalo, NY, Jessie Meeder demonstrates their new larger-scale aquaculture system. They scaled up to a 35,000-fish tilapia system after having success with their 2,000-fish system, profiled in another video on this channel. What is Aquaponics? * 9:55 mins. * Non-media commercial system. Adam Harwood at Lilly Pond Farms in Texas provides an overview of the past, present and future of aquaponics including his commercial aquaponics experience based on the UVI [University of Virgin Islands] system; a deep-water application of Aquaponics with a sustainable, natural farm concept modeled by Lilypond Farm.